Hoping some of the experts on the forum or other members with the same issue can help me out. 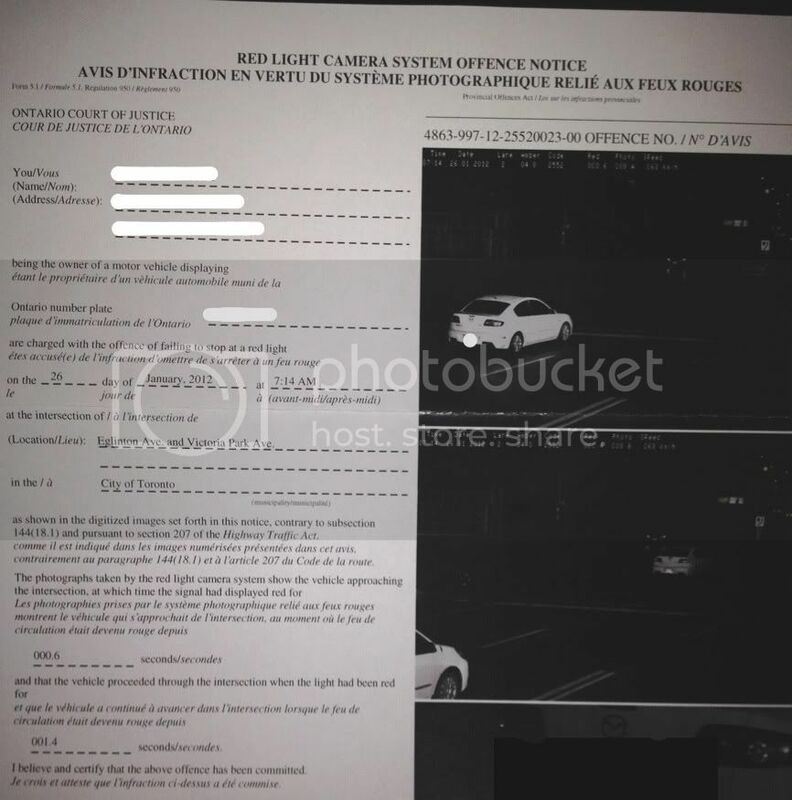 I recently received this ticket in the mail, not surprising since the sky lit up with the camera's flashing when the infraction took place. As another member mentioned in a previous post, I created a Photobucket account and have uploaded my ticket for your review. The conditions were not ideal, and I felt that I could not stop safely before the intersection. I did attempt to break (photo1), but made the decision to safely go through the intersection, knowing the light "just" turned red (000.6 seconds according to the ticket). My question to the experts: how should I plead? I read about how this will not affect my points or insurance, and I also read about "if there are no street signs in the picture then there is lack of evidence", or something to that effect. Oh, and the fine is $325.00. If anyone could provide me with some suggestions or advice, that would be great! I'm not aware of any requirement for street signs to be visible in the photograph. I think as long as there is some type of location code in the photograph itself it's considered sufficient, but someone else may advise otherwise. As for road conditions, you won't be able to use that as a defence since it's an absolute liability offence. Basically the Court is only cares if you stopped or not, not why. Thank you for the reply. I've decided to plead guilty, hoping to decrease the amount of the fine. From the options listed on the ticket, I'm assuming Option 2 will allow m to speak with a prosecutor before having to appear in from of the JP? Judging from previous experiences, is there any form of evidence required to demonstrate a 'lower income/ supporting a family on one income' (e.g., listing income vs. expenses, bank statement)?